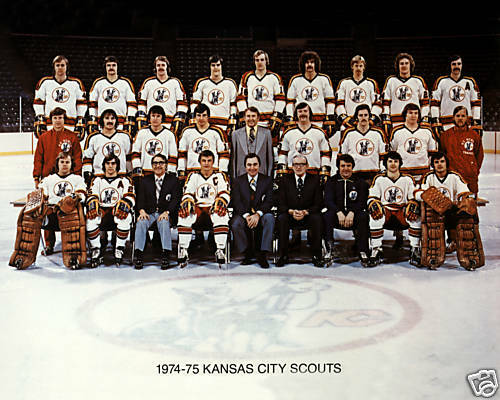 Just like the ’76-’77 Cleveland Barons, the ’74-’75 Kansas City Scouts will now be their franchises representative for all three of the first three Ultimate NHL Playoffs. Behind a hat trick from Ed Gilbert, the ’74-’75 Scouts took Game 1 by a score of 5-4 as each goaltender made over 50 saves, which would happen quite often over the six game series. Game 2 as a much more lopsided affair as the ’74-’75 Scouts won 6-1 to take a 2-0 series lead. Goalie Peter McDuffe allowed just one goal on 54 shots against for a .981 save percentage while Guy Charron led the way offensively with a goal and two assists. The ’75-’76 Scouts got on the board with a 3-2 win in Game 3. Gary Croteau scored in the final minute of regulation to break a 2-2 tie to win the game. Denis Herron allowed two goals on 57 shots in the victory. In Game 4, the ’74-’75 Scouts led 4-2 after two periods, but the ’75-’76 Scouts tied it up at four just four and a half minutes into the final period of regulation. It remained tied at four until Wilf Paiement scored at the 14:09 mark of overtime for the ’74-’75 Scouts, his third of the game. It was the ’75-’76 Scouts who won in overtime in the following game as Croteau put home a rebound to extend the series to a Game 6. However, two goals from Charron in the final minutes of Game 6 broke a 4-4 tie and won the game and the series for the ’74-’75 Scouts. Up next is the Qualifying Tournament for the old Pittsburgh Pirates. This entry was posted in Qualifying Tournament, Ultimate NHL Playoff and tagged Butch Deadmarsh, Chuck Arnason, Denis Herron, Ed Gilbert, Gary Croteau, Guy Charron, Kansas City Scouts, Peter McDuffe, Qualifying Tournament, Simon Nolet, Ultimate NHL Playoff, Wilf Paiement. Bookmark the permalink.